SMA STP3.0 Three phase inverter. Only 17 kg: quick installation and compact. The Smart Connected Service offers maximum system availability. 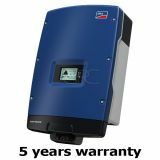 SMA STP4.0 Three phase inverter. Only 17 kg: quick installation and compact. The Smart Connected Service offers maximum system availability. 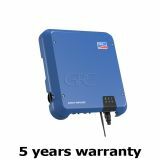 SMA STP5.0 Three phase inverter. Only 17 kg: quick installation and compact. The Smart Connected Service offers maximum system availability. SMA STP6.0 Three phase inverter. Only 17 kg: quick installation and compact. The Smart Connected Service offers maximum system availability.